We received some great feedback on our Halloween playtest, and have been hard at work over the last two weeks fixing the issues that have been reported. Thanks to everyone who has tried the playtest and reported bugs or other feedback! We are now happy enough with the stability and integration of all the new features to mark today?s new playtest build as the first release candidate for our upcoming December release. We encourage you to give this release a good try out, especially if you like to play competitively online, because if we don?t hear your balance complaints now then you will be stuck with them for the next few months until our next release! You can report any issues you have by filing a bug or joining our IRC channel. As usual, you can find the installer for your operating system on our download page! Surprise bonus feature! 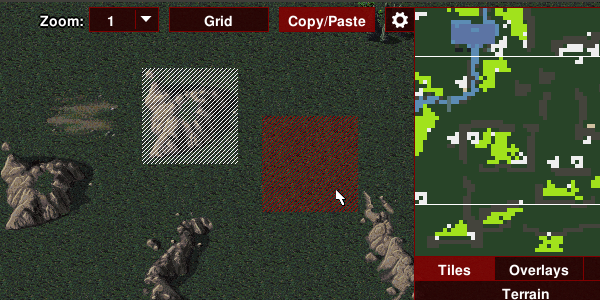 Copy/paste is now available in the map editor. The second Big Team Tournament concluded yesterday, and was a huge success. Two teams of 11 players battled over the last week to a 30?30 tie. The tie was resolved with a final battle between the two team captains, which ended with a decisive victory for Team Kyrylo! Replays for all 61 tournament matches are available here (summary), and the first batch of archived live-streams can be found on hamb?s YouTube page. Games from FiveAces? and SoScared?s streams will be exported and uploaded in the coming days. Thank you to all of our players, our fantastic live streamers FiveAces, SoScared and Hamb, and to everyone who watched the streams and participated in the live chats on Mumble and IRC!